Tutti Frutti rugs, like the old saying 'a picture speaks a thousand words' this is very true with our stunning Tutti Frutti range. 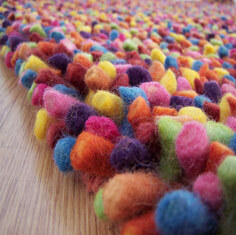 Brightly coloured woollen yarn stitched together gives this modern shaggy rug an uniqueness and blend that's simply stunning. The use of specially selected felted wool gives each rug style, taste and diversity, this combined with fashionable colours adds up to a stunning collection. Hand-woven in India.